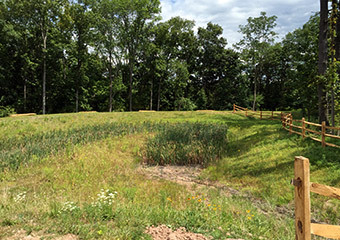 Hanover Engineering was selected and retained by the Perkiomen Watershed Conservancy to complete site assessment, wetland evaluation, engineering design, regulatory permitting, bidding assistance, and construction observation for a proposed constructed wetland system to treat stormwater runoff at the Upper Frederick Township Municipal Complex in Montgomery County, PA. Based on the site analysis and hydrologic modeling, an Extended Detention Constructed Wetland System was selected for the site as the most appropriate and effective system for the optimal treatment of urban stormwater. Hanover Engineering’s wetland biologists conducted an evaluation of the proposed project area to identify and delineated all regulated wetlands and watercourses. The lead wetland biologist and project engineer then worked together on the development of the proposed constructed wetland system, using guidance provided by the PA Department of Environmental Protection, US Department of Agriculture, and US Environmental Protection Agency. The final design provides treatment for water quality, as well as volume control up to the 100-year design storm. Hanover Engineering’s careful planning and design of the stormwater facilities resulted in streamlined permitting, with only a State waiver approval and a Statewide General Permit required, along with a National Pollutant Discharge Elimination System General Permit. The project also includes educational components consisting of a boardwalk and kiosk that highlight the water quality, wildlife, and aesthetic values of this unique stormwater Best Management Practice.